PARKING LOT DUTY: – Monday – Oriani, Petrosky, Pratt, Tuesday – Quakenbush, Ramos, Regan, Wednesday – Roumayah, Reid, Rivera, Thursday – Roye, Rudnick, Ruffini. If you are unable to fulfill your obligation, please trade with another family. Thank you! · Robert Silaghi! Robert was last week’s TRACK winner. He was nominated by Mrs. Tedesco for being helpful in the cafeteria. Keep up the good work, Robert! 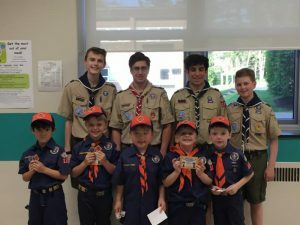 · Tiger Scouts on their recent Advancement! And thank you to the older scouts who helped out! THE 2018 FUN RUN COMMITTEE is looking for volunteers to shadow this year and join the committee for 2019. Fun Run is a popular family event held in September. If interested or just want more information, please contact Deanne Seifert, deanneseifert@gmal.com, or Ann Lazar, annlazar@ymail.com. DO SOME GOOD! In memory of St. Hugo Alum, Alex Thoresen, who passed away after a battle with cancer, we will be collecting toiletries (travel size deodorant, shampoo, toothpaste, toothbrushes, etc) to be donated to the Ladies of Charity. While Alex greatly appreciated that family and friends kept him in their thoughts and prayers, his greatest wish was for those around him to perform an act of kindness for a stranger – to spread a little love on his behalf to make him feel better during his challenging time. Please consider making a donation in Alex’s memory. Donations will be accepted in the office through May 24. Thank you for your consideration! WANTED! We are looking for families to sponsor tattoo booth and face painting for Field Day for grades K-3. We need approximately 250 tattoos and face painting for 200 students. If you can help, please contact Miss Fleischer, megan.fleischer@sthugoschool.org. RAFFLE REMINDER! As you know, the raffle was a mandatory fundraiser. If you did not purchase/sell raffle tickets please make your $300 donation to the school as soon as possible. Thank you all for supporting our school! SAFETY, SAFETY, SAFETY! Please refrain from cell phone use while in the parking lot at dismissal, and please park in a designated parking spot. We ALL need to follow these simple rules to keep ALL of us safe! Thank you! THE ALTAR GUILD is looking for volunteers for their upcoming Rummage Sale. Students can get more information by going to the volunteer section of their webpage: www.sthugo.org/rummagesale.